You can-�t always predict where your workday will take you. But you can be prepared for anything, anywhere. 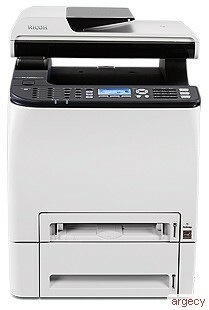 The compact RICOH� SP C250SF Color Laser MFP offers high-quality Print/Scan/Copy/Fax capabilities for small offices and workgroups and helps you get the information you need, when you need it. With the constant hustle and bustle of buzzing work environments, the SP C250SF helps you meet everyday workflow demands with a host of productivity-enhancing features and produces documents in vibrant color for lasting impact. Is your Smartphone or tablet nearby? Simply download the Ricoh Smart Device Print & Scan app to print to the SP C250SF directly from your personal mobile device. Designed with user-friendly controls to simplify administrative tasks in any environment, this multifunction system offers all-in-one performance to complete more jobs in less time and fits virtually any workspace -� including desktops, retail counters and executive offices. Move from job to job quickly with print and copy speeds up to 21 pages-per-minute for both full-color and black-and-white documents. Capture, edit and send information instantly and cost-free. A full suite of Scan-To document distribution capabilities allows users to leverage existing infrastructure to improve document-related processes. Share information easily with a strategically placed USB port located on the front of the system. This gives users advanced Scan-to-USB functionality and convenient access for printing images from a digital camera using PictBridge� - software. Replace the standard yield All-In-One print cartridges in seconds with a convenient top-loading design. Accommodate more media with thick paper support up to 42 lb. Bond/83 lb. Index-� for sizes up to 8.5" x 14"-�from both the Standard and Bypass Trays. Minimize filing space, postage costs and paper waste with standard automatic duplex printing. *Declared yield values in accordance with ISO/IEC 19798. Actual yields may vary based on types of images printed and other factors. The Ricoh SP C250SF ships with a set of four starter All-In-One print cartridges yielding 1,000 pages each. All other consumables ship at full yield. -The Ricoh SP C250SF is under warranty against defects for a period of one year from the date of purchase. Consumables are under warranty for a period of 90 days from the date of purchase or until depleted, whichever comes first. Please refer to warranty documents shipped with the product for more details.